Is Natural Stone An Environmentally-Friendly Choice? Granite, marble, travertine, and other natural stone materials can create a warmer and more inviting atmosphere in a home or office space and serve as an excellent choice of décor, especially for nature lovers. However, environmentally conscious people may wonder whether it leaves a significant carbon footprint. 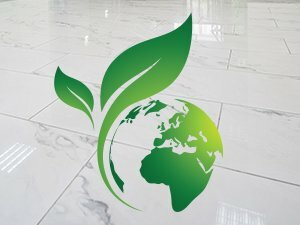 We asked Fred Hueston, Chief Technical Director for surpHaces and Founder of Stone Forensics to weigh in on whether natural stone is an environmentally friendly choice. Here’s what he had to say. Stone can be found in almost every country in great abundance. For example, marble has been quarried in Carrera, Italy for centuries, and there is still an abundant supply. In the United States, there are quarries within 500 miles of nearly every major metropolitan area. Quarry techniques have also improved worldwide, and most of the time, explosives are no longer required. “It’s a pretty clean industry with zero waste,” said Hueston. There is very little environmental impact in stone fabrication, because fabricators use specially designed wet blades to greatly reduce the amount of silica, or stone dust, that is released into the air. Unlike stone, composite materials like wood, brick, ceramic, glass, and concrete require natural resources and energy to create. Many recycled composite materials contain polyester binders, which are basically plastic, and can emit VOCs (volatile organic compounds), because they are solvent based. The lifespan of composite materials is also limited, unlike natural stone, which virtually lasts forever. Polyester resins in engineering materials will break down over time and are sensitive to heat and sunlight, which is why natural stone is the preferred choice for outdoor décor. What About Cleaners and Sealers? Environmentally friendly, pH neutral cleaners are recommended over harsh cleaners for natural stone. And according to Hueston, nearly all sealers used on natural stone are water-based and FDA approved. Have you ever visited to an old church or historical building where the original granite or marble floors, walls, and other surfaces were still in use and looking untouched by time? Natural stone not only can withstand centuries of traffic and use, but with proper care and regularly scheduled maintenance, it can continually look brand new. When natural stone is damaged, in most cases, it can be completely restored, and if for some reason it is damaged beyond repair, it does not have to end up in a landfill. It can be used for other building materials, like gravel, for example. According to Hueston, calcium-based residual material from marble quarries is used for vitamins, medicines, and antacids. There is even a North Carolina quarry that uses their waste for local chicken feed. The great thing about stone is that it came from the earth, and whatever is not recycled can be simply returned back to the earth. Chris and his team. What really impressed me was before the guys brought any equipment into our home, they applied protection to all surrounding areas, floors and furnishings. The level of care, workmanship and detail was truely well above any other company we have hired in the past. Thanks again! We have a white Calcutta kitchen benchtop that had years of stains and scratches. We were recommended to Set in Stone so we had them come out and take a look. They were able to remove all the staining and bring back the shine of a new bench and than apply a protective coating which will never allow my bench to stain or etch ever again.